Communication Edge: The T7 has a USB Type-B connector and an RJ45 Ethernet connector. The T7-Pro has those and also has an SMA-RP female connector and a WiFi antenna. Power is always provided through the USB connector, even if USB communication is not used. Screw Terminal Edge: The screw terminal edge has convenient connections for 4 analog inputs, both analog outputs, 4 digital I/O, and both current sources. The screw terminals are arranged in blocks of 4, with each block consisting of VS, GND, and two I/O. Also on this edge are two LEDs. The Comm LED generally blinks with communication traffic, while the Status LED is used for other indications. DB Edge: The DB Edge has 2 D-sub type connectors: a DB15 and DB37. The DB15 has 12 digital I/O. The DB37 has the same I/O as the screw-terminals, plus additional analog inputs and digital I/O, for a total of 14 analog inputs, 2 analog outputs, 2 fixed current sources, and 11 digital I/O. USB: Can be used for host communication. Power is always provided through this connector. Ethernet: 10/100Base-T Ethernet connection can be used for host communication. WiFi (T7-Pro only): 2.4 GHz 802.11 b/g WiFi connection can be use for host communication. LEDs: The Power and Status LEDs convey different information about the device. VS: All VS terminals are the same. These are outputs that can be used to source about 5 volts. GND/SGND: All GND terminals are the same. SGND has a self-resetting thermal fuse in series with GND. 10UA/200UA: Fixed current sources providing 10µA/200µA at a max voltage of about 3 volts. 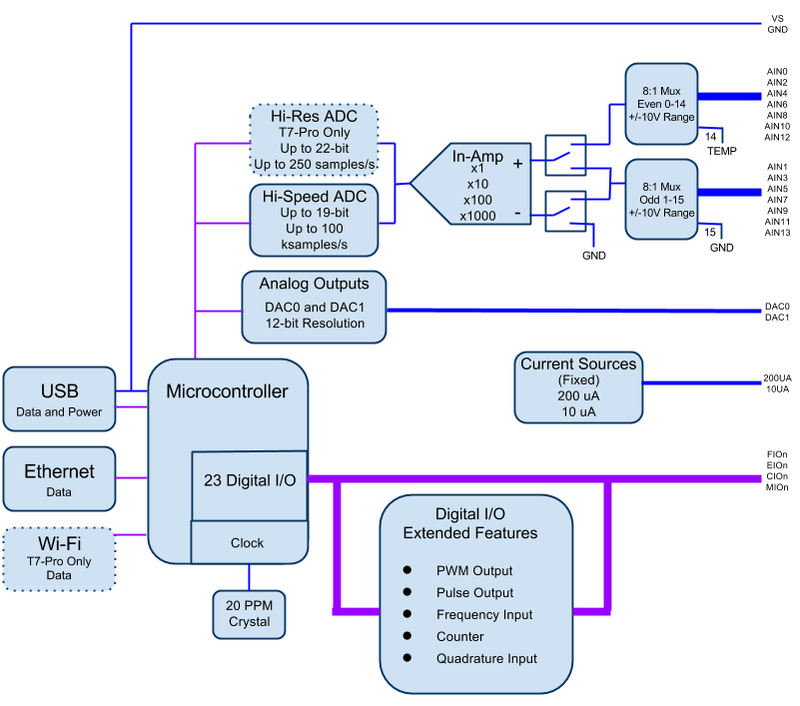 FIO#/EIO#/CIO#/MIO#: These are the 23 digital I/O, and are also referred to as DIO0-DIO22. Besides basic digital I/O operations, some of these terminals can also be configured with Extended Features (frequency input, PWM output, etc. ), and all can be configured for various serial protocols: I2C serial, SPI serial, SBUS serial (EI-1050, SHT sensors), 1-Wire serial, and Asynchronous serial. AIN#: AIN0-AIN13 are the 14 analog inputs. DAC#: DAC0 & DAC1 are the 2 analog outputs. Each DAC can be set to a voltage between about 0.01 and 5 volts with 12-bits of resolution. For information about reading inputs, start in Section 3. For information about setting outputs, start with the Waveform Generation Application Note. See the Family Variants page.